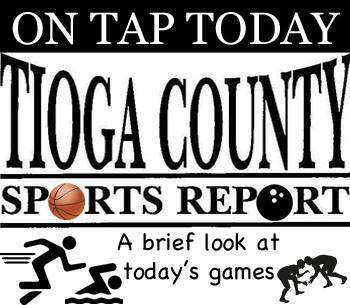 TIOGA COUNTY - The Section IV Division II Wrestling Championships continue to take center stage. Also on the docket are the Section IV girls class bowling tournaments. Section IV Division II championships at Windsor, 9 a.m: Day two begin with wrestlebacks at 9 a.m. while the semifinals start at 10 a.m. The championship finals are slated to start at 5 p.m.
Owego's Cam Bundy, SVEC's Mark Mullen, Newark Valley's Trentyn Rupert, and the Tioga trio of Brady and John Worthing and Austin Lamb, all seeded first in their respective weight classes, have reached the semis. The top two seeds at each weight made it through unscathed, but three third-seeded wrestlers suffered upsets in the quarterfinals. Six of the 15 fourth-seeded wrestlers were upended as well. Tioga, the two-time defending team champion, has 94 points and leads host and second-place Windsor by 23 points. Owego, SVEC, Newark Valley and Waverly are in sixth, seventh, ninth and 10th place, respectively, in the 25-team field. Section IV class championships at Vestal (Midway Lanes), 9 a.m: Waverly competes in Class B, Newark Valley compete in Class C, and Candor and Tioga compete in Class D. Owego is not participating.